Wrought iron and steel fencing provides unsurpassed strength and durability. We provide Montage(r) fencing, with their multilayered E-Coat coating process, which makes the product suitable for any weather, any climate, and anything you can throw at it. These maintenance free fences are backed by a 20 year warranty. You can trust a sturdy steel or iron gate to keep your property safe, and be there to welcome you home for years to come. We offer caps in a menagerie of styles. You can find something to match the rest of your fence, or you can mix and match for your own unique look. A quality fence needs quality hardware. 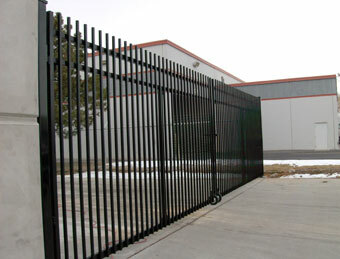 Fence specialist offers a wide select of poly-carbonate, or zinc and powder coated steel hardware. We use only high quality, commercial grade hardware will last for years. Spring loaded self closing hinges are available, great for pool fences or additional security. Our iron railing can compliment any deck or porch design. All rail components meet or exceed building code standards. ADA compliant railing available.